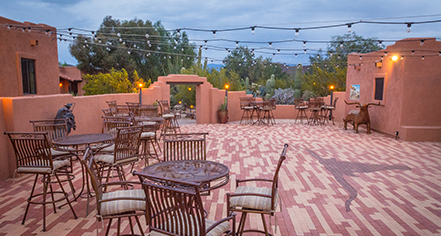 White Stallion Ranch offers numerous flexible meeting rooms for retreats, business, casual, and special occasion events. The 1,911 square foot Longhorn can accommodate up to 150 guests, and the 667 square foot Brahma can accommodate up to 45 guests. The Longhorn and Brahma can be combined for up to 195 guests and both meeting rooms have speakers wired in the ceiling, with wireless mics available on request. Projectors and large screens are available for presentations and WiFi is provided in all meeting spaces. Catering for events is done in-house, or guests can arrange outside catering if desired. Welcome parties with cash bar and appetizers can be provided for group events. Groups are served meals at the same time as other guests on the ranch, with snacks and drinks provided in the meeting space. 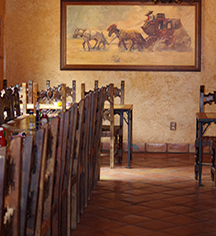 Should a group book the entire ranch, meal times can be customized to the event schedule. Group members are able and encouraged to join in all ranch activities, including horse riding, during their free time.